From intimate and elegant to modern and group friendly, our restaurant dining and seating options will suit any kind of venue. We keep large stocks on hand of indoor and outdoor restaurant furniture, so we’re ready to meet your needs with seating, chairs, tables and stools. That means if it’s in stock, you can have your restaurant furniture in just a few days! Have a look at our exclusive Resin Rattan Range of chairs and lounges made from durable, weather resistant moulded resin, which stands up beautifully to high loads and use and harsh weather conditions. 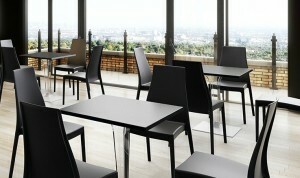 Other restaurant, bar and dining furniture suppliers can’t give you the same amazing choice and value.